In the case of non-payment of the duties, the car had to be destroyed and the simplest way to do so was to tip it into the nearby lake. 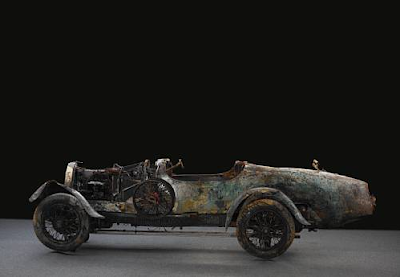 To facilitate its recovery the Bugatti was attached to a heavy chain, but when this finally corroded away the car fell to the lakebed at a depth of 53 metres. It remained there, undiscovered, until 18th August 1967 when diver Ugo Pillon located the mythical Bugatti, which was lying on its left side, partly buried in the mud. Pillon had been searching for it for some time and after its rediscovery the car became a popular target members of the local sub aqua club. 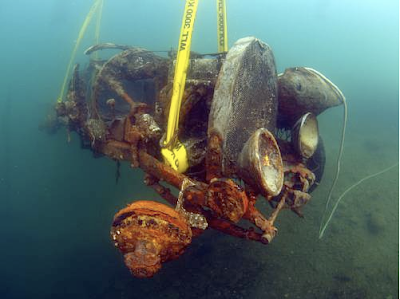 On 12th July 2009, after a 73-year sojourn in Lake Maggiore, the Bugatti was finally rescued from the lake by Jens Boerlin and his comrades from Ascona's sub aqua club. After 73 years, it appears the mass of this car has diminished by 80%. With an estimate of 70,000-90,000 Euro, one realizes just how rare Bugattis are. And I thought I've had some ambitious junk car projects!